1.One Britannia Bourbon Biscuit Pack worth Rs 25,We get 26 Paytm wallet cash code in each packet. 2.We will buy it with peppertap using 150 off on 250 coupon so that we can grab 10 Britannia Bourbon Biscuit worth 250 in just 100. 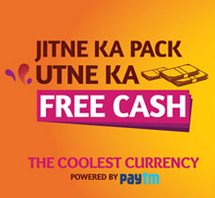 3.Now we have 10 Britannia Bourbon Biscuit with Paytm Cash Code. Note : Buy Britania Bourbon Biscuit From Peppertap Right now using below mentioned steps before it will get out of stock to get benefit of this offer. " 2.Select your city and area. 5.You can see Britania Bourbon Biscuit there worth 25. 6.Now add quantity as 10 packets and make cart value Rs 250. 8.Enter your Name & Email. 10.After apply coupon you cart will turn to 100. 11.Make Payment with COD Or Paytm wallet. 12.After your Britannia Bourbon Biscuit will get diliver. 13.Under each pack you will get Rs 26 Paytm Cash code. 14. Now go to Paytm-Bourboun Offer Page. 15.Apply All Coupons There.You can apply only 6 coupon in one account.So to apply next 4 coupons just login in paytm with another account and apply remained 4 coupons there.